The class 12 or Higher Secondary Certificate (HSC) result will be declared by the Tamil Nadu Board on May 16. The Tamil Nadu HSC Result 2018 will be released on the Board's official website- tnresults.nic.in. Students who had appeared for the class 12 examination may check their results, once released on the board's official website- tnresults.nic.in. Tamil Nadu HSC Result 2018: The class 12 or Higher Secondary Certificate (HSC) result will be declared by the Tamil Nadu Board on May 16. 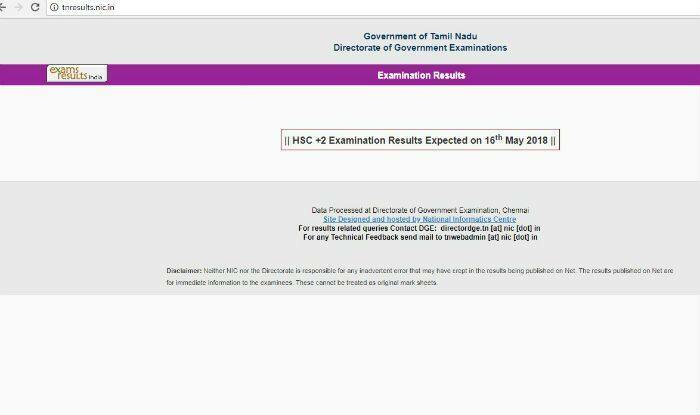 The Tamil Nadu HSC Result 2018 will be released on the Board’s official website- tnresults.nic.in. Students who had appeared for the class 12 examination may check their results, once released on the board’s official website- tnresults.nic.in. The declaration date has been confirmed on the Tamil Nadu Board’s official website- tnresults.nic.in. Apart from the official website, students may also check their results at examresults.net. Also, other websites such as the tamil-nadu.indiaresults.com, dge.tn.gov.in, dge1.tn.nic.in, tnresults.nic.in and dge1.tn.nic.in will releasing the Tamil Nadu HSC Class 12 Results, so students may also check on these sites in case they encounter any problem with the official website. The Tamil Nadu HSC or class 12th examination was conducted by the Directorate of Government Examinations (DGE) Board from March 1 till April 6. The HSC examination was held at various test centres. As announced earlier, the Tamil Nadu Board would not disclosing the names of toppers or their percentage as it breeds negativity among students and gives them mental stress. State education minister Sengottaiyan confirmed the same saying that declaring toppers marks causes mental harassment to children.